Trade rivalry in the age of chartered companies. 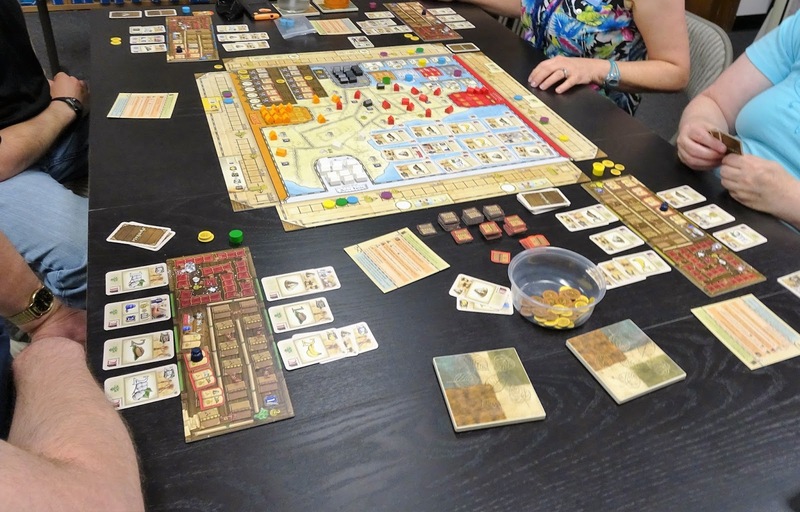 Mombasa is a strategy game that features a rotating display hand mechanism at its core. It also throws in elements of area control, stock manipulation, hand management and a little worker placement. In short, there is a lot of interesting decisions to be made during the course of a game. Four exploration companies are competing to generate the most value for their stock holders. Players can acquire shares of stock in any or all of the companies. Each company has a double sided board placed on their side of the main game board. This board is where players track the number of shares acquired. Movement up the track can also yield other benefits, like coins or other bonuses. The heart of the game revolves around a unique card play mechanic. Each player starts the game with the same 9 action cards that will be altered by a starting token that they have chosen from the 2 dealt to them. The selected starting token will give each player a different benefit and tell them which 3 of their 9 starting action cards will be placed above their player board in 3 separate slots. These cards will not be available for a player to use in round 1 of the 7 rounds that comprise the game. At the start of each round, players simultaneously select 3 action cards from their hand and place them face down in the 3 slots below their player board that line up with the 3 slots above the board. After everyone has placed their selections the cards are then revealed. In turn order, players use their action cards. When all actions are completed, each player will select the card(s) from only one of the slots located above their board and add them to their hand. Next they will move each played action card from its slot below their board to the corresponding slot above the board. In this way players build card combinations for use in future rounds. The different action cards can be used to do a number of different things. Goods cards are used to acquire additional action cards or to advance along 1 of the stock tracks. Expansion cards are used to advance 1 of the company’s area of control across a map of Africa gaining you benefits along the way. Expansion is where players have an impact on the value of a company’s stock causing it to increase or decrease. A bookkeeper card is used to move a player’s token along the book track on their player board. A diamond merchant card is used to move a player’s token along their diamond track also located on their player board. Both the book track and the diamond track can yield major points at game end depending on how far a player has advanced. In addition, each of these tracks has a point when reached that opens up another action card slot (both below and above their board) allowing the player to increase their number of playable action cards each round from 3 to 4 and 5. Eventually, a player can have up to 5 action cards in play per round. Additionally, players have 2 bonus markers that can be place on an empty bonus space to gain extra actions for use in the current or next round. These bonus action opportunities consists of advancement on the stock tracks, claiming the 1st player marker, gaining additional coins, acquiring an action card, gaining an additional good, increasing your expansion movement, or grabbing an additional bookkeeper or diamond merchant for use in the next round. In this way you can add to the number of actions you can take in a round. After 7 rounds players add up points for their remaining gold coins, the point level they are at on each of their diamond bookkeeper tracks, and calculate the value of their shares in each company they have stock in. The player with the most points wins. 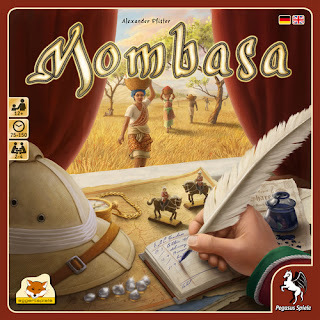 Mombasa is a game where there are a lot of little things going on that total up to one big game. This is a game that will require multiple plays to learn how to orchestrate all of the mechanics into a powerful point-generating machine.